& Happy - In An Instant! Have you ever had a day when everything you did or said was just perfect? In a business or social setting, or while playing a game? You were "in the zone," on fire... you could do no wrong. And how about times when you couldn't do or say the right thing, make a right decision, say no to the second helping, get a hit or catch a pass if your life depended on it... You just "didn't feel right" or you were "having a bad day." We all have. One day you can be on top and the next day nothing goes right. The one difference between the most accomplished, happiest, most powerful people and everyone else is that the successful people in all areas of life can summon the most suitable states of mind on command. The top performers in life can get themselves motivated and inspired exactly when they need to. They can go from feeling despondent to feeling unstoppable almost immediately, if necessary. The most effective people can get focused in seconds when they have to. Fit, healthy people are that way because they control their moods - they can get themselves to exercise the same time every day, the same number of times every week. Week in, week out. They always say 'No' to the wrong foods. They never, ever overeat. And it's all because they control their states... their moods. Top performers in life can summon the emotions that create the ability to excel at things that terrify most people. 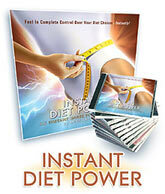 And now, because of the remarkable Instant Inner Power programs, so can you. If you want to win more, to achieve more, to be more... if you want to be happy without needing drugs, alcohol or prescription medications right now, you MUST be able to change your states at a moment's notice no matter where you are or what you are doing. And Instant Inner Power programs will make it happen for you. My name is Mike Brescia. I'm the founder and CEO of Think Right Now! International. I started www.ThinkRightNow.com from my garage and built it into the #1 most visited personal development product web site on Earth. I authored the book, 'Today Is Your Day To Win,' which has been read by over 130,000 people in over 60 countries. Through our products at thinkrightnow.com and now with Instant Inner Power programs, I've manipulated and combined existing scientific brain discoveries to give not just advice, but easy to use tools that are effective at changing people from the inside out. And in my years researching the underlying causes of success and failure, by far the two most powerful technologies for growth and achievement I have ever seen are State Generation and Anchoring. Each Instant Inner Power program uses both these remarkable processes, which give you the amazing ability to enter the states of mind you need to be in in order to achieve challenging goals AND the ability to summon them on command any time you need them. If you're thinking that what you just read may be the most amazing thing you've ever heard, you are absolutely right. It is life altering. It is revolutionary. And it's only available right here. State Generation is the process where you intentionally put yourself or someone else into a specific mood (or state) so that you/they can do what needs to be done well as you/they can possibly do it. Getting your chores all done and/or giving your dad compliments before you ask him if you can take the car out. Yelling, "Who's your daddy?!" to players on opposing teams. These are all attempts to manipulate someone's mood in order to achieve a desired result. But your moods can't change that quickly, you say? Have you ever been instantly brought to tears during an emotional scene in a movie? I'll bet you have. Ever felt scared stiff during the very same movie? How about when a close friend you haven't seen in a long time surprises you by showing up at your birthday party. Instant state change? What if Ed McMahon showed up at your door with a very large check in hand? You'd immediately be jumping up and down with excitement no matter what mood you were in before! Ever get some really bad news (family member or friend in an accident, someone died, lost the sale, didn't get the job)? It was devastating. No matter how cheery your mood was before, it immediately shifted. Instantly, you couldn't think about anything else. THAT is how fast YOU can change your state. Are you starting to understand how useful having the power to immediately shift yourself into your most resourceful, powerful states can be? 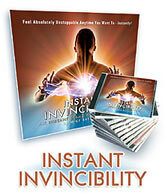 That is why Instant Inner Power programs are the most incredible personal development programs you've ever seen. In each Instant Inner Power program, I will quickly get you into the desired state of mind using both your memory and your imagination until, by the end you are in exactly the mood you need to be in to consistently get your desired outcomes. "Anchoring is the most effective technique I know for constructively channeling our powerful unconscious reactions so they're always at our disposal. It's a way to ensure that we always have access to our greatest resources." Anchoring is what happens naturally when you are in an intense emotional state and something unique happens over and over while you are in that state. Eventually, the state and that unique "something" get linked up with each other in your mind and your body. A classic example of anchors is the study by Dr. Ivan Pavlov. You remember. He's the one who let hungry dogs see and smell meat, but wouldn't let them eat it. Soon the dogs began salivating like crazy. When that happened, Dr. Pavlov rang a bell of a very specific pitch. He did that over and over. Soon, all he had to do was ring the same bell, and the dogs would salivate profusely as if the meat were in front of them. A neuro-association was created between the bell and feeling hungry or salivating. A very common example of a naturally created anchor is when a child who is, let's say... either overweight or just not very athletic gets teased unmercifully on the playground for any error made while playing a game/sport. Every single time this treatment occurs, a negative anchor to the game/sport is being formed and strengthened. So what is very likely to happen is that into adulthood, that person will have absolutely no interest in playing sports or in exercising in any way due to the negative feelings linked up all those years ago to the athletic pursuits on the playground. Do you want to get rid of your negative anchors that stop you from doing the things you dream of? Do you want to literally install some of the most empowered states of mind imaginable, and do it in around an hour? 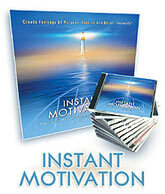 First, each IIP title takes you quickly through an emotional guided visualization, during which you will literally throw away and destroy the 11 core disempowering, failure producing, anxiety creating mental patterns (related to each title's subject) recorded in your brain tissue that makes the right decisions and actions too often feel difficult or impossible. Yup, you 're just going to throw them away. We will scramble the programmed, habitual mental patterns and the memories of failure so thoroughly that you won't be able to "run" them any more. Brain represents goal related tasks/decisions as larger, scarier and more difficult than they truly are. This adds to fear and paralysis, further making goal achieving activities difficult/impossible. Brain represents mistakes/setbacks/delays as more damaging than they actually are. Creates frustration, fear, anger, anxiety. Visualizing/imagining future poor/failed actions and poor/failed results (creating a well rehearsed script to follow). These are the core mental habits that every person alive runs when they are failing to achieve any desired outcome. These are unconscious mental programs that run without you even being aware of it. They are the source of most depression, frustration, anger, jealousy, fear, laziness, boredom, impatience, dishonesty and pessimism. Think about it... when you are afraid, when you are procrastinating, when you load on the sour cream, when you decide to watch TV instead of practicing or studying the information that could make you rich/healthy/happy/productive, when you throw the interception or miss the shot, you're not aware of these brain functions. You may believe that you wouldn't get to play/get an 'A' whether you practice/study or not... now you are going to lose. It's the way you "think about things" (the way your brain represents them to you) that controls your moods/states. 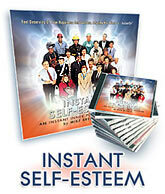 By blowing away these learned mental blocks to success at the beginning of each program, you will have readied yourself to create the perfect mental state for success related to each Instant Inner Power title's subject. At the end of Program 1 of each title, you will feel open to the possibility of finally being able to reach your goal/dream... Open to the idea that you actually can control your states of mind completely. The second of the three things that each Instant Inner Power program does is to put you into an empowered state of mind where, when you are in it, everything seems to work... Your decisions are excellent. They feel easier to make. You work faster. You work more accurately. You're more confident. It's easier to visualize your success beforehand. Failing rarely, if ever, crosses your mind. You are thinking only of winning, of succeeding, of the next step and the next. In this state you are focused on getting your way, determined to succeed no matter what you have to do. This is where you will literally get vibrating with excitement. This occurs in the second half of each audio program where you will enter what I call the Reference State, the state of mind where the decisions and actions that help to accomplish your outcomes feel easier... as if you've been doing them for years. These are the states of mind that the winners in life summon when they need to be "in the zone." This is where the healthiest eaters go in their mind whenever they think about food. These are the mental states that the most fit people enter when they are pushing themselves to their physical limits and loving every minute of it. These are the states of mind where you become 100 times more likely to succeed at whatever you want to do than you are in your typical moods. In each program, instead of just asking you to remember past successes or imagine that you are succeeding, I'll take you through what I call the 11 Mental Patterns of Success. Listen to the Demo now. All your senses will be involved. By amplifying all 11 of these unconscious automatic brain functions in just a few minutes, by the time you reach the end of each session, it is very likely that you will feel like your body is vibrating. ...As if you had a small energy cell inside you. Oh, I guarantee that you have never felt anything like what you will feel as you are listening to Instant Inner Power programs! The image of a success - Your mood will begin to change almost immediately as you begin to imagine that in every way you already are the person you desire to be, the ultimate success in the area pertaining to each title's subject. Purpose/Mission oriented - Next you will then be guided to think of every possible benefit of reaching your outcome... benefits to you, others, your community and even the world. You will feel closer to the big "Why" than you ever have. This is a natural procrastination killer. Visualizing/imagining your desired outcome - You will be guided to clearly see and experience yourself doing everything necessary to succeed as well as what you and your life will be like after you reach your dream. Desire/Determination - To immediately increase your determination to make these images and feelings come true, you will be guided to look at, in the most attractive terms, the benefits of reaching those outcomes. Then you will focus on what you will lose if you don't succeed. This will light a forest fire of desire in your gut. Confidence - You will be guided to remember times when you did your best, when everything was going great - and to imagine how your "hero" feels when doing things related to each title's subject. Action orientation - You will be guided to see yourself successfully taking all the steps needed to succeed, the planning, making the correct decisions, taking the right actions, the productive meetings, whatever is necessary. It is all working out in your mind now. Love the entire process - You will then be guided to see the positive, the good, the fun in every single action you take on your success journey. You will manipulate your perceptions so that you will actually begin to enjoy tasks and decisions (related to each title's subject) that may have seemed awful up till now. Keep setbacks/problems in perspective - You will mentally shrink the size of any possible setbacks that could occur on your way to your goal. So frustration, anxiety, anger and other overreactions will be less and less an issue when things don't go exactly as desired. Appreciate/love what you get both inside and out - You will be brought to a place where you can see, hear and feel what your life will be like after you reach your outcomes... the result of being able to enter your Reference State as often as needed. Being constantly aware of and enjoying what you earn and become by reaching challenging goals is a foundational mental pattern of all champions in life. Happiness/Pride from your accomplishments - Unlike enjoying benefits, this critical mental pattern of feeling proud of what you achieved helps you to stay motivated to keep getting results. The final scene in each IIP program will make you feel so good, so happy with yourself and your efforts, so loved and appreciated that you may be brought to tears... lots of them. Have the tissues handy. By the time you reach the end of Program 2 on all Instant Inner Power programs, you will be in a state of mind at that moment that is probably 20 times beyond anything you've ever felt (related to the program's subject matter) in terms of determination, commitment, confidence and being able to see and feel yourself already as the person you want to be, comfortable with succeeding, and with doing whatever you need to do to achieve your success. So at that moment, you are at the peak of emotion. Probably the coolest part about Instant Inner Programs is the third thing each program does... the anchoring of your desired peak states. Remember a moment ago when you learned about what an anchor is and how they naturally get created in your body/mind? Well, on Program 2 of each title, as you are building and amplifying the intensity of the emotions (creating your Reference State), you will repeatedly be asked to do and say something unique. On some programs, I'll simply suggest that something in your environment from now on will trigger this state of confidence and commitment. As your conviction, determination, self-belief, happiness and action orientation is created and magnified, this unique "anchor" is getting linked to this state of mind. So from that moment on, when you want to be in the same mood/state, all that is required is that you "trigger" the anchor by performing/doing that same unique thing and saying the same unique statement, you did while building your reference state... and voila', you'll instantly be in a similar empowered state of mind again. This will happen just as surely as Pavlov's dogs salivated when they heard the same bell that was anchored to their hunger state. At this point, you may be wondering what the implications or benefits are to being able to access peak performance states. 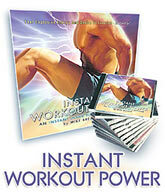 It all depends which Instant Inner Power programs you use. Every mood has different uses. Feelings of love and romance aren't very useful when playing soccer. A great suggestion is to listen to the demonstration session now. This will give you a strong sense of the enormous power that resides inside of you just waiting to be released. In the demo (Program 2 of Instant Invincibility), the state created is extreme confidence... confidence so strong, you feel like you can do just about anything. In about a half hour, you will be feeling strength and power that you didn't know you had. Enjoy! I'm so confident that you will find Instant Inner Power programs to be the most Earth-shaking, life-altering programs you've ever experienced, that we back them up with a complete risk-free guarantee of satisfaction. I personally guarantee that if you use any of our audio programs, you'll see measurable improvements in your life. But if you're not 100% satisfied, simply return the product any time within 6 months from the date of your order and we'll issue you a no hassles refund immediately upon receiving the return. No clauses, no conditions - it's as simple as that. This means that your purchase is absolutely risk-free! We're the ones taking all the risk for you... So, you can't possibly lose, unless you pass this up and don't even try! And you will feel it instantly. You will be guided to construct the most powerfully confident state of mind you could possibly imagine. Then, Mike will "anchor" these powerful, positive feelings to you so that you can effortlessly trigger the exact same achievement producing emotions any time you want - instantly! You will be guided to construct the most inspired state of mind you could possibly imagine... motivation so strong that you'll feel like you can achieve absolutely anything. Then, Mike will "anchor" these determined, driven feelings to you so that you can effortlessly trigger the exact same achievement-producing mindset any time you want - instantly! You will be guided to construct the most vital, self assured yet still down-to-earth state of mind you could possibly imagine. Then, Mike will "anchor" these wonderfully positive feelings to you so that you can effortlessly trigger the exact same poise and self-belief any time you want - instantly! You will be guided to construct the most focused diet-conscious state of mind you could possibly imagine... so strong that in this state, you will always make healthy diet choices-no matter where you are, what the occasion is or what is on the menu. Then, Mike will "anchor" these focused, confident feelings to you so that you can effortlessly trigger them to help you make the most health-conscious diet decisions possible every time - instantly! You will be guided to construct the most energetic and enthusiastic state of mind and body you could possibly imagine... so focused that your next workout will be the best workout of your life. Then, Mike will "anchor" these powerful, positive feelings to you so that you can effortlessly trigger the exact same passion and desire to work out any time you want -instantly! Copyright © 2016 Think Right Now! Int'l/ Inteletext, LLC.